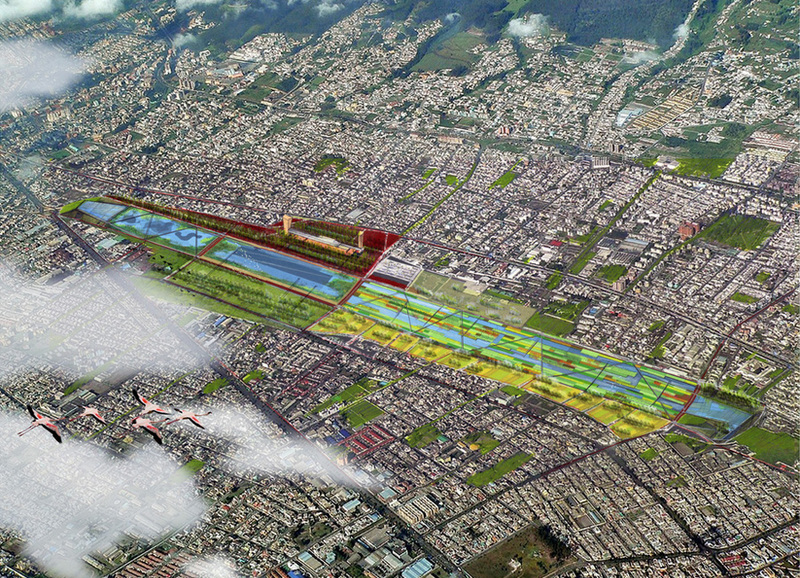 While desperately trying to organize our archives, we discovered an entry to an old ideas competition (whose website has since dissipated into the digital ether) for the transformation of Quito's international airport after its planned closing. It was designed by a trans-university team of professors and students from Arizona State University, the University of Illinois and Cal Poly. In the interest of disseminating ideas, especially good ones, we're reproducing their images below. They're quite gorgeous, luscious even. A closer look reveals that some of the scale figures look as though they've been drawn by a deviant medieval monk dreamt up by Umberto Eco. There are fishermen with haloed cat heads, sheep-headed urban farmers also with halos, a goat-headed flâneur with a parasol; it's a menagerie of cryptids catalogued by Charles Avery during an altermodern journey to a magical realist landscape. This design for the Parque del Lago in Quito, Ecuador celebrates the rebirth of Latin American culture as the last vestiges of colonialism wane in the early 21st century. It capitalizes on local conditions to grow a design suited to the needs of the city while celebrating Ecuador's status as a country of megadiversity. The Ecuadorian flag is the inspiration that organizes the design and provides a symbol for the capitol city. Three bands compose the reuse of the airport lands for a new urban park: agriculture, water, and market. These bands correspond to the colors of the flag, the yellow zone is agriculture and park use, the blue is water and the market area is the red zone. We won't try to summarize the rest of it and instead will copy-paste it in full in the comments. For those that revel in project statements, it's a good read, recommended to our student readers. The entire proposal is quite pragmatic, not overly stylized or indulgently complicated. Their considered approach to restitch Quito's urban fabric is convincing. If the competition wasn't merely an ideas competition but actually was looking for something to build, it might have had a good chance at garnering the top prize and a commission. In the center of the site, the water unifies the design. It runs the length of the long axis, stepping down in elevation at each cross road. Tilted planes of water are the boundary on each end. Over this long dimension, there are four types of water, a 'chinampa' like area, an urban lake, a high andean lacustrine lake, or paramo, and the tilted planes of water on the ends. The central water bodies function for agricultural needs, urban needs and ecological function. The northern body of water is the agricultural area. This area recalls the historic furrows of the original lake, and creates a flexible area in the northern district for agriculture. A 'chinampa' like system of landfilled plots inside the water body can be used to grow crops and flowers for sale at the local markets. The urban location of the agricultural plots could foster educational areas for tourists or children to learn about farming upon the high Andean Plateau. The cross section of the body of water has a shallow shelf for the agricultural furrows and a deeper section for ecological habitat and function. The central body of water , The Lago Centro [u1] is an urban lake with edge conditions that facilitate sitting along the edge of the water. This water can be used to float stages for large concerts or events, for daily activities such as kayaking or small boats, or other purposes. It is a multi-use body of water situated east-west between a recreational park and an urban plaza. The cross section of this lake has a shallow shelf on the west side with an urban edge of steps, and on the east side is a native type of condition of a high Andean lake. On this east side is a shelf that gradually falls to become a deep water lake. The southern body of water is an ecological restoration of high Andean wetlands like the paramo. This area is a place to research, demonstrate the wetlands and the methods to restore them[u2] . It is expected that the patch size of the southern lake, in tandem with the other lakes will be big enough to attract avian species and hold a functioning aquatic ecosystem. The cross section of this area includes both shallow shelves and deep water areas to facilitate mixing of nutrients and species diversity. The plan has deeply developed perimeter conditions through curves to attract edge species and create microhabitats. This lake can recapture a sense of the native condition of the area. The bodies of water on the ends provide symbolic and visual interest. As the excavation occurs for the lakes along the long axis, the earth can be moved and deposited on the ends of the site. The excavation will support tipped planes. On the insides, facing the park, these planes will be water bodies that reflect the sky. These planes symbolize the tectonic shifts that allowed the lakes to exist, and the water falling down the surfaces can remind city dwellers of the fantastic waterfalls in the country. Perceptually, the waterfalls may reflect the sky or appear white walking along the inside of the park. The height of the planes on the ends may block the line of the horizon, allowing sky and water to merge in view. The waterfalls aerate the water, moving it down a steep surface to add oxygen. The planes are also observatories; users can walk to the top to see the surrounding volcanoes or the city below. On the outsides of these planes facing the city are canyons with native plantings. The soaring rise of the earth at the ends of the former runway may remind some dwellers of the rise of the airplanes from the ground. On the east side of the site, overlapping with the water in the northern lagoon is the 'agricultural' area. This area is a space for crops, natural plantings and recreation. This zone is a set of plots that may be expanded or re-used as city needs develop and change. A significant amount of land could be used to continually stabilize parts of the economy through local agricultural production of flowers and food crops. These furrows can be places to educate youth in the city about natural processes and to research the capacity for restorative urban agriculture in the Andean city. The southern end of the 'agricultural' area would be a meadow. This area, east of the Lago Centro mentioned above, has the potential to be an instant park. Our team proposes that the golf course use be shifted to multiple park programs for active and passive recreation, taking advantage of the existing vegetative structure and trees. The market area is a place for the spirit of the people to be expressed. Red-toned pavers symbolize the 'blood of the people.' A grid of trees is a canopy over this paved area that unifies the disparate elements on the western edge of the site. The paving system has four plazas, three along the west side of the terminal building and one on the east. These plazas break up the mass of the paving, while stitching them together with a narrative. There is a set of plazas and a grand promenade along the west side of the lakes with kiosks, celebrations and ceremonies. Each plaza can be a tribute to the zodiac, celebrating the four months of the struggle for freedom. Statues or art in each plaza relate to the creature of the zodiac that corresponds to each month, with June, the final month of the struggle for freedom being in front of the new terminal building. The plaza facilitates contemporary culture while reminding citizens of their past. Two significant programs infuse life to this market area. The terminal building is reused as a convention, conference and community center. We propose adding an additional floor on top of the building and creating an interior promenade on the facade facing the park. This new facade would be a type of loggia extended down the facades of the buildings facing the park in the market zone. This architectural treatment unifies the disparate buildings and creates a civil, public appearance to the park. At each end of the terminal building is a hotel. These trapezoidal buildings in elevation (whose form helps block the equator sun), [u3] attached to the convention center, by the park, and at the new transit hub for the northern district of Quito, would be significant economic generators. On the east side of the market zone would be multimodal transit. In front of the new community center between the hotels are areas for automotive transportation, while immediately to the south is a a road that contains the street car system and the local buses. Adjacent to these roads are the waiting areas for the passengers. ENHANCING THE NORTHERN DISTRICT THROUGH CONNECTIVITY. The park will make the Northern District legible and functional for connectivity. The space will be a landmark in two ways; the ground, a local low point in the city will appear yellow, blue and red, using the national colors. People may see a giant flag on the ground. The trapezoidal towers and tipped end planes will be figurative elements that are landmarks for people moving through the city on the ground. These elements rising in the skyline will orient and identify people in the northern district. Functionally, the park will connect the northern district through four significant east-west connections, two north- south, [u4] and a pedestrian/bicycle system will stitch together the movement system east-west. We propose using the service roads for the runways as interior roads to the park, linked to the city at the ends. The design will improve the quality of life of the residents by having parts immediately available, and through the multiple programs the site can foster. The multiple uses, transit connectivity, community center and road linkages enhance capacity for social integration. The lake recalls historic conditions through restored wetlands with native species, agricultural plots with domesticated species, and proposes a contemporary urban condition in the central lake. The new hotels and convention area spur economic growth along with new road network east-west. [u5] Connectivity will enhance urban function and productivity. The agriculture area is very very interesting.